Roger Humbke grew up on a homestead, across the dirt trail from a one room school (New Berlin) in Alberta, Canada. His grandmother, father and mother all attended the same school which was renamed during WW I for fear of being burned down. Roger attended the newly named Verdun School until grade 3, when they were bused to the village of New Norway. There was no power, running water or telephone, but there was a battery radio and Roger’s imagination ran wild. As a young boy, he was always interested in how things worked and would constantly take objects apart to see if he could put them back together into working order – most often failing. 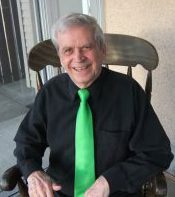 As a teenager, Roger was fascinated with science and on the family’s monthly trip to the small local cities of Wetaskiwin or Camrose, He would spend his .50 cent allowance on chemicals at the local drug store. It is hard to imagine the excitement he experienced when one day while exploring an isolated slough he found a recently landed weather balloon complete with a box of gadgetry attached. Instruction were to return it to the government, but the desire to open it up and inspect (and dissect) all the parts was just too great. His parents never knew!. As a child with ADHD (Attention Deficit Hyperactivity Disorder) and an Addictive Personality, Roger was an impulsive, inattentive child who was described as a pyromaniac and known as the black sheep of the family. .
Roger realized that he would need to control his impulses and when his mother put him in a one year program to train as a teacher at the University of Alberta and he made a big change. He switched his interest from science and math to the social sciences as he prepared to lead a more acceptable life. Every chance he got he took courses in philosophy, creativity, abnormal psychology and criminology, but what really interested him was the states of consciousness, hypnosis and dreams. One elective offered him the chance to write a research paper on a topic of his choice and he chose “dreams”. Off and on for the next 50 years he watched as the study of dreaming become more acceptable in Western higher academics and today one can study lucid dreaming at Harvard, Oxford or MIT. Lucid dreams are dreams in which you are consciously aware that your are dreaming and that you can consciously control what you dream about, Personally, Roger has had various degrees of success in lucid dreaming and would like to invite Seniors and all generations to join him in his journey of becoming a practitioner. Remembering and controlling your dreams are skills that Seniors can learn, They enable you to change both the beliefs and the results you strive to achieve in your life time. Recent discoveries and research in memories and DNA point to exciting possibilities for lucid dreams and having conversations between your subconscious mind and deceased relatives. Imagine consciously controlling a conversation between your subconscious impressions of who your great grandfather or great grandmother were and your own subconscious mind. On March 9, 2016 Roger started https://www.humbke.com – a website about the Humbke Family’s History (Humbke-Conradi-Callies-George-Fontaine-Harris) in the USA and Canada. His goal is to use Lucid Dreaming to connect with ancestors and relatives thru visitations within the dream world. The subject of Lucid dreams appears to be very interesting. I have not thought about dreams being lucid but no doubt some of my dreams about deceased relatives fit into that category. I am not sure that I would want to consciously control a conversation with my ancestors, although it could be interesting. On the other hand it could be scary. I would have to think carefully before I entered into such a conversation. However, to visit Rogerâ€™s website about the Humbke Family History would no doubt be enlightening. Thanks for taking the time to positively comment on my lucid dreaming web site. It is very motivating and encourages one to continue on creating content. I have looked at some of your blogs and appreciate your efforts to help us newbies avoid spending too much time going down the wrong paths and being frustrated. I will come back soon and post more. At first I was fearful that I was “over the hill” for lucid dreaming (I am 66 years old) but after two years of diligent journaling and focus I have gone from my very first lucid dream to having an average of one lucid dream every 7-8 days. But I’m greedy, lol, I want more. Have added your site to my watch list and will send more comments soon. Keep up the good work and thanks again for all your hard work. So happy to see a comment now and then. Mostly I feel I am writing for myself, but once in a while someone comes along and makes it all worth while. Back in April, 2018, a 29 year old millennial, contacted me as a result of the website and we have become the best of friends. He was running a Lucid Dreaming Weekly Meet-Up her in Edmonton which I have since joined. . Besides that we now meet weekly as friends to discuss Lucid Dreaming, Consciousness and all the ways we can gain skills to contact our individual sub-conscious in an effort to expand our understanding of ourselves and the surrounding environment. Being over two generations apart we bring totally different experiences and perspectives to the discussions. Meditation, Yoga, Hypnotism, Trances and Psychedelics are just some of the topics we discuss and study in depth. One of my main interests is to use my subconscious to better understand and appreciate my ancestors. To-date I have had some limited success with meeting ancestors in lucid dreams, but only on a visual basis. I believe that my subconscious contains many experiences and knowledge, from age 0 to 75, which I am not presently capable of remembering or bringing to awaken-consciousness, but that it is likely possible to do so through learning new skills. I look forward to hearing of your experiences with lucid dreaming.